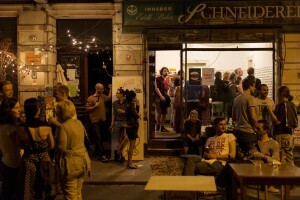 For four years Karina Pombo Garcia has been living in Dresden. Especially one street of the German city amazes the PhD candidate from Spain. “The people in this part of the city are very open-minded and welcoming”, Karina Pombo Garcia explains, while a couple is moving a couch on a trolley past her. The Spanish researcher has been living in the Dresden district Äußere Neustadt since 2011. Particularly one street has won Garcia’s heart and mind: Louisenstraße, which crosses the entire quarter: “Whenever I come here, it feels like home. Just like at my birth place in Galicia the entire life happens on the street – even during cold German winter months.” The HZDR scientist likes to unwind at this place from a busy day at the lab. 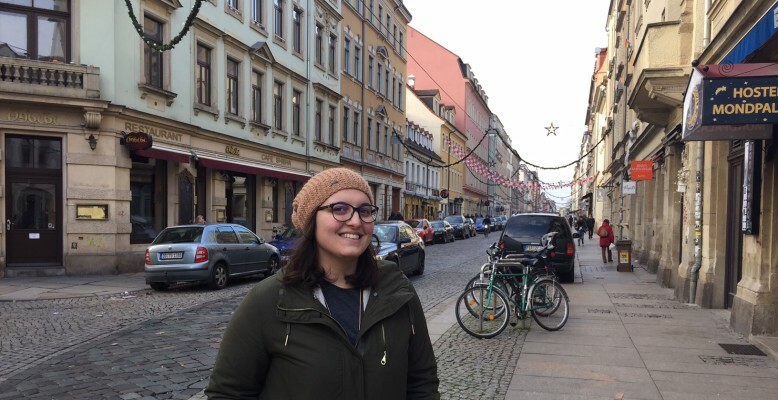 “Sometimes I meet friends here, at other times I just sit down, eat a falafel and watch, what happens around me”, the PhD candidate describes. “It’s a great location to stroll around, but also to meet new people, if one is in the right mood.” Her private life is, thus, somewhat similar to her research topic. Garcia tries to develop nanoparticles, which combine all essential elements to detect tumors. In the best case scenario the tiny particles would “stroll” trough human bodies, until they attach themselves mostly to the diseased cells via special modifications of their surface structure. “Since the nanoparticles are superparamagnetic and also radioactively marked, it becomes possible to highlight tumors with MRI and PET scans in this way”, Garcia explains. Nevertheless, this high density of research institutions was one of the reasons, why the Spaniard decided to move from London to the Saxon capital for her PhD thesis: “I did not want to live in a huge city anymore. Although Dresden is relatively small, everything one needs can be found – in particular scientifically. In my opinion it is not only one of the best places to do research, but also to live in.” And if a feeling of homesickness should ever creep over her, Louisenstraße and its friendly people always await.